Having trouble recruiting top talent for your ambulance company? Struggling to keep up with staffing all of the rides you can provide? Finding quality EMTs can be tricky, but trying a few things your competitors aren’t might pay off very nicely in the long term. 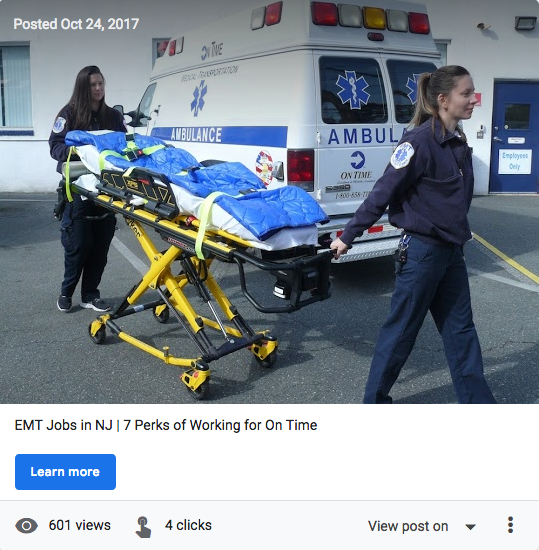 Here’s a look at a few unique ways to attract to EMT talent using social media and Google. 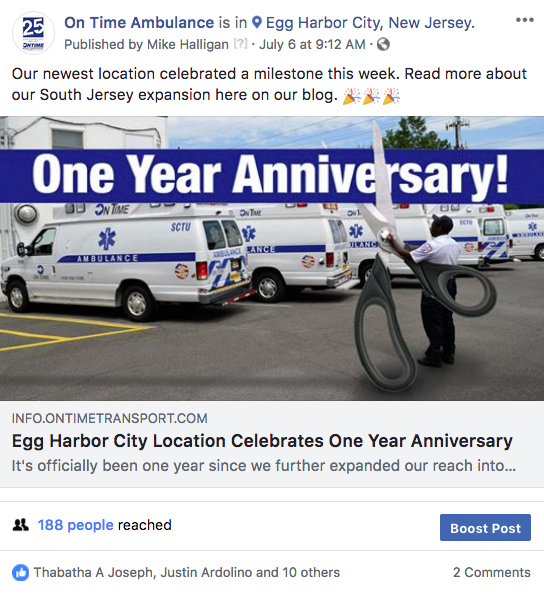 To recruit EMTs and drivers through Facebook, Instagram, and Google My Business, you’ll need to highlight your company culture; not just your employee benefits. Focus on employee success stories, career opportunities, and daily life at the company. Set up a system of getting user-generated content from your employees in the field. This way, whoever wants to contribute can contribute. 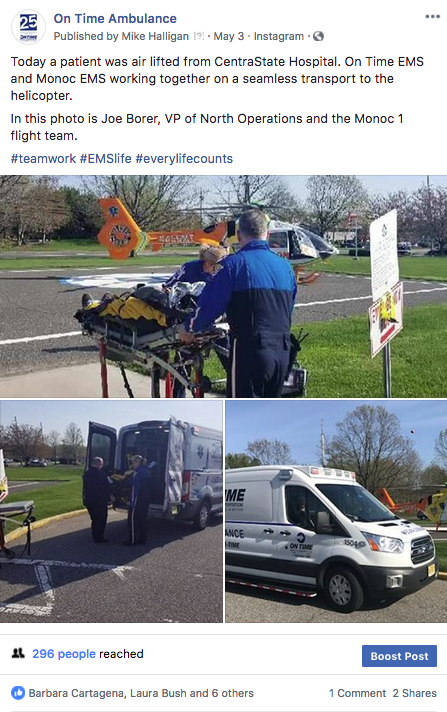 When you're posting authentic photos and videos taken by real staff members, your followers can virtually experience life in the EMS World. Engage and entertain your followers through photos, blog posts, educational seminars, philanthropic events, office life, holidays, and more. 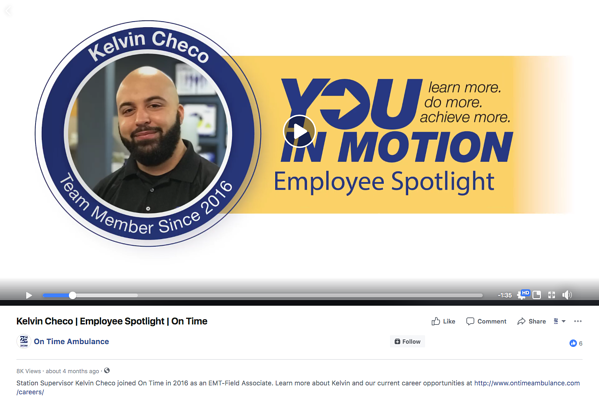 Use Facebook advertising tools to promote employee videos to audiences across your area who fit into in your target demographic. Regular posts that get the most social engagement should be boosted and or turned into ads and served up to lookalike audiences to raise your profile in your geographic region, and if you want, the whole country. Advanced audience targeting makes this particularly easy. To further drum up recruiting, use Facebook Jobs to share job postings and public events to interact with applicants/prospects easily through the Facebook inbox. Try using Facebook Jobs to share job postings to reach more people around you. Applicants can easily submit info about themselves and get back to you all right from Facebook on their phone. The messages will arrive right in the inbox of your company Facebook page, so make sure you have someone from HR monitoring this stream on a regular basis. 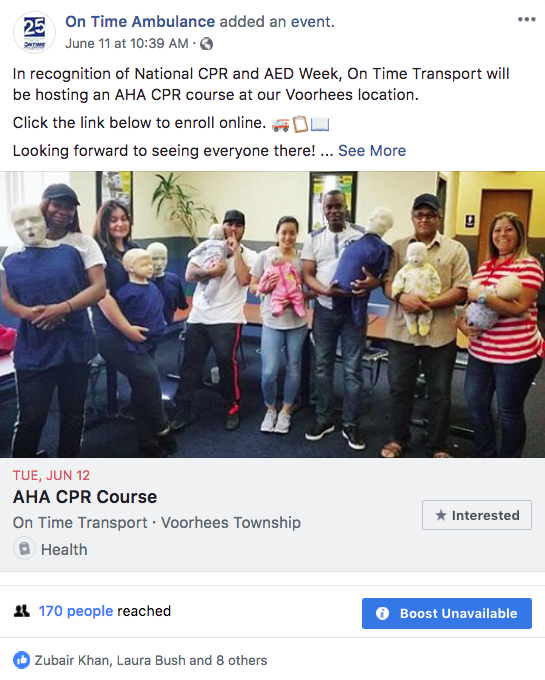 When you have public events like EMT classes or CPR refreshers, create public Facebook events and/or posts. Encourage current employees to share with their networks. You can even boost these events as well to increase their reach. Bonus tip: Share helpful info that your target audiences are looking for on your blog. Each time you create a new post, promote it on your social channels. On Instagram, interact with and entertain followers in the industry. Try following other EMS companies, fire departments, senior care facilities, police departments, and local news media outlets for networking. Make sure to use relevant hashtags to boost your post reach potential. 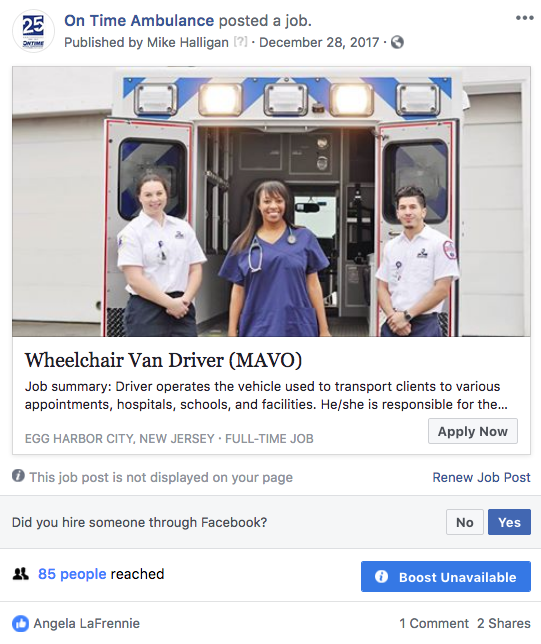 Attract prospects when they search Google for jobs related to EMS: EMTs, Dispatchers, Wheelchair Van Drivers, and Critical Care Nurses. On Google My Business, post content regularly, optimize your profile, and track keywords your targeted audience may use to find ambulance companies and EMS jobs. Also make sure to create separate GMB listings for each unique location --- as long as it meets the criteria. So there you have it. 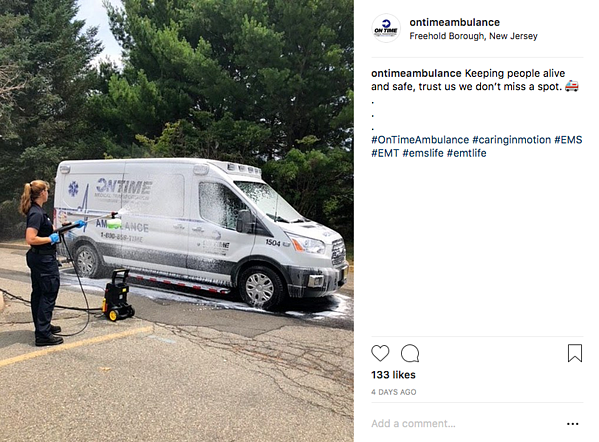 Those are our semi-unconventional ways to recruit new employees to your ambulance company using social media. Give these a try and you might find yourself ahead of your competition, and taking on many more trips in the process. JAM Graphics is a leader in inbound marketing for ambulance companies across the country. We have years of experience in this specific field, and can help you with growing your ambulance company or private medical transportation service.